Objective: Experimental autoimmune encephalomyelitis (EAE) is a widely used model for multiple sclerosis. The present study has been designed to compare the efficiencies of oral and intraperitoneal (IP) administration of D-aspartate (D-Asp) on the onset and severity of EAE, the production of neurosteroids, and the expression of neurosteroid receptors and inflammatory mediators in the brain of EAE mice. Methods: In this study, EAE was induced in C57BL/6 mice treated with D-Asp orally (D-Asp-Oral) or by IP injection (D-Asp-IP). On the 20th day, brains (cerebrums) and cerebellums of mice were evaluated by histological analyses. The brains of mice were analyzed for: 1) Neurosteroid (Progesterone, Testosterone, 17β-estradiol) concentrations; 2) gene expressions of cytokines and neurosteroid receptors by reverse transcription polymerase chain reaction, and 3) quantitative determination of D-Asp using liquid chromatography-tandem mass spectrometry. Further, some inflammatory cytokines and matrix metalloproteinase-2 (MMP-2) were identified in the mouse serum using enzyme-linked immunosorbent assay kits. Results: Our findings demonstrated that after D-Asp was administered, it was taken up and accumulated within the brain. 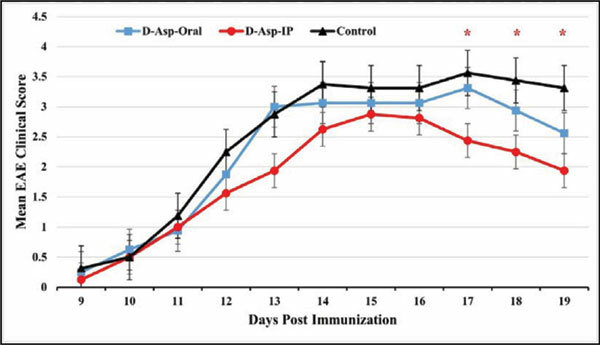 Further, IP injection of D-Asp had more beneficial effects on EAE severity than oral gavage. The concentration of the testosterone and 17β-estradiol in D-Asp-IP group was significantly higher than that of the control group. There were no significant differences in the gene expression of cytokine and neurosteroid receptors between control, D-Asp-IP, and D-Asp-Oral groups. However, IP treatment with D-Asp significantly reduced C-C motif chemokine ligand 2 and MMP-2 serum levels compared to control mice. Conclusion: IP injection of D-Asp had more beneficial effects on EAE severity, neurosteroid induction and reduction of inflammatory mediators than oral gavage. Experimental autoimmune encephalomyelitis, matrix metalloproteinase-2, D-aspartate, neurosteroids, TNF-α, IL-6, CCL-2.